Scientists have found a new way to explain the hearing loss caused by cisplatin, a powerful drug used to treat many forms of cancer. Using a highly sensitive technique to measure and map cisplatin in mouse and human inner ear tissues, researchers found that forms of cisplatin build up in the inner ear. They also found a region in the inner ear that could be targeted for efforts to prevent hearing loss from cisplatin. The study is published in Nature Communications(link is external), and was supported by the National Institute on Deafness and other Communications Disorders (NIDCD), part of the National Institutes of Health. 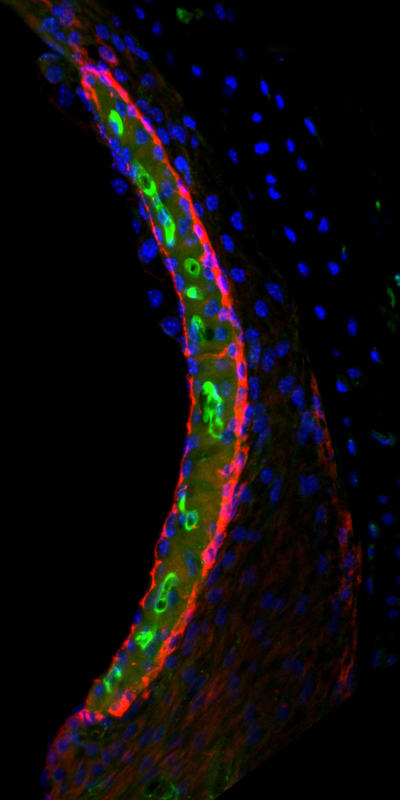 Cisplatin (appearing in green) in the stria vascularis of a mouse inner ear. “Our findings suggest that if we can prevent cisplatin from entering the stria vascularis in the inner ear during treatment, we may be able to protect cancer patients from developing cisplatin-induced hearing loss,” said Cunningham. About the National Center for Advancing Translational Sciences (NCATS): NCATS conducts and supports research on the science and operation of translation—the process by which interventions to improve health are developed and implemented—to allow more treatments to get to more patients more quickly.